Chicken Binakol (Another Version) Recipe - Gutom Na! Posted on Thursday, January 26th, 2017 at 5:20 pm. Sauté garlic, ginger, onions, tomatoes. Add chicken and continue to sauté until all sides are light brown. Pour young coconut meat, buko juice and chicken flavor bouillon cubes. Add-in tanglad (lemongrass) stalks. Stir and cook in medium low fire for 45 minutes. Add potatoes and continue to cook until tender, stirring occasionally. 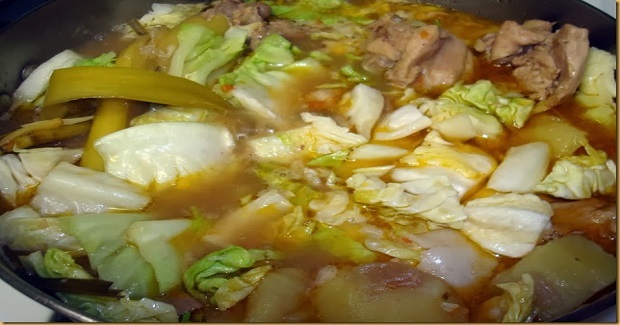 Add cabbage and simmer for 5 minutes.